Burke’s father co-founded Trek Bicycle in 1976, out of a "red pole barn" in Waterloo, Wis. The company grew to become the largest bike manufacturer in the United States, and has been pivotal to Mary Burke’s case in her effort to oust Gov. Scott Walker (R.). Burke mentions her role at Trek in nearly every campaign appearance. As head of Strategic Planning for Trek, Burke focused "every single day on improving the company’s bottom line," according to her campaign website. 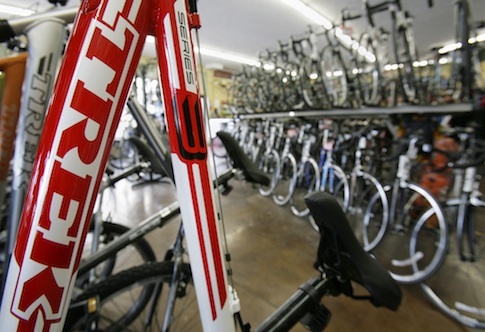 Trek, which claims its bicycles can "combat climate change," has sales of roughly $900 million. However, according to records from the Wisconsin Department of Revenue obtained by Fox 6 in Milwaukee, Trek Bicycle has not paid net income taxes since at least 1982. Fox 6 reported that the Burke campaign "doesn’t want to talk about the company’s record on taxes." According to the records, Trek files under "Subchapter S" of the tax code, which enables the company to avoid corporate taxes and pay as individuals at a lower rate. Trek spokesman Eric Bjorling has defended the practice, saying that majority of businesses take advantage of the loophole. The news report noted that more than two-thirds of the 25 of the largest businesses in Wisconsin are not paying net income taxes. "Trek has always complied with state and federal income tax laws," he said. "S corps are the most prevalent type of corporation with 61.9 percent of all corporations filing a Form 1120S in 2003." During her campaign, Burke has indicated that she is open to tax increases, including for businesses, saying that she believes in people "paying their fair share." "I think if you look at Wisconsin … that our highest tax rates are certainly in line with other states, certainly higher than some and lower than others," Burke said in November. "I think it's not only the tax rate but other types of deductions and things. But I believe in people paying their fair share." When asked recently if corporate taxes are a "significant detriment" to businesses in Wisconsin, Burke said no, citing her family business. "I will go back to my experience at Trek," she said. "Trek has started from a couple of people to nearly 1,000 people, and has been successful, and thinks that Wisconsin is a great place to do business and has never considered leaving it. Do they feel the taxes need to change? I don’t think that’s on their top 25 list of things in making sure Trek Bicycle is a successful company." The company also received an $875,000 loan funded by Wisconsin taxpayers, while Burke was serving as Secretary of Commerce for the state. Trek used the loan to build a new facility, and $392,300 of that loan was forgiven, according to Bjorling. According to Fox 6, Burke herself paid more than $120,000 in taxes in 2012. However, the Milwaukee Wisconsin Journal Sentinel also reported that Burke avoided paying state taxes in the early nineties despite her claims that she began working for Trek in 1990. The Burke campaign blamed the error on a "typo," and said she did not begin working for the company until several years later. The Wisconsin GOP has harshly criticized Burke for touting Trek on the campaign trail, but avoiding commenting on the company’s tax history. "Mary Burke is quick to highlight her time at Trek as an essential part of her qualifications, but when asked to document specifics, her campaign remains silent," said Joe Fadness, executive director of the Republican Party of Wisconsin. "Burke is applying for a job touting her past work experience, but her former employer refuses to confirm any of her claims. Voters deserve to know the truth." This entry was posted in Politics and tagged 2014 Election, Mary Burke. Bookmark the permalink.